Protests are smokescreen for unfolding US-Saudi-Qatari backed violence seeking regime change in Sudan. The Associated Press reveals that recent and ongoing “Arab Spring-style” unrest in Sudan’s capital of Khartoum is led by Sudan’s Western-backed opposition, the National Umma Party, and the various faux-NGO’s and “independent media” organizations created by the West to prop it up. This reveals yet another Western-engineered uprising designed for regime change in favor of a new, Western friendly client regime. Activists acknowledge they have no unified leadership or support from political parties but express hope the spontaneous nature of the current round of protests means they’re gaining momentum. After the sermon, protesters marched through the district, a longtime opposition stronghold, chanting “the people want the downfall of the regime,” the slogan heard in Arab Spring uprisings that began in late 2010 and have led to the ouster of the leaders in Tunisia, Egypt, Libya and Yemen. Angry protesters torched police and dozens of gas stations and government buildings, and students marched chanting for al-Bashir’s ouster. AP, perhaps hoping readers would not bother researching the matter further, also quotes “local blogger and journalist Reem Shawka” to bolster their narrative. Shawka is a columnist at Sudan’s 500 Words Magazine. 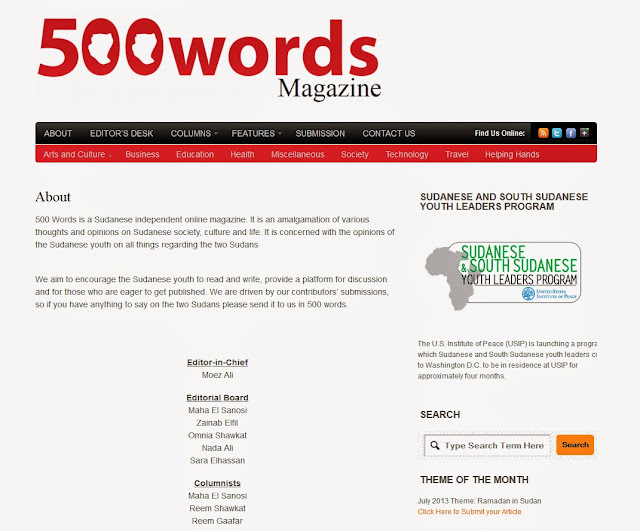 While 500 Words maintains that it is “a Sudanese independent online magazine,” it proudly advertises in the right column of its website an upcoming US Institute of Peace “Sudanese and South Sudanese Youth Leaders Program.” Like Thailand’s deceitful US-funded propaganda front Prachatai, 500 Words is most likely directly funded by the US government, and is most certainly in tune with the US State Department’s agenda and talking points regarding Sudan. Image: Sudan’s “independent online magazine,” 500 Words proudly advertises for the US Institute of Peace on its website (right-hand side), exposing the predictable ties between its support for Western-backed opposition inside of Sudan and the US State Department through the National Endowment for Democracy and others, who most likely funds the online propaganda front. Indeed 500 Words’ editor-in-chief, Moez Ali, has his own page on “Open Democracy” – funded by Open Society Institute, the Oak Foundation, the Sigrid Rausing Trust, TIDES, and many others. It should be mentioned that the US Institute of Peace – advertised for on 500 Words – has played an instrumental role in the Western-engineered “Arab Spring,” where it literally crafts the constitutions and structure of proxy regimes the West plans to create once targeted nations have been overthrown. Who is Opposition Leader Sadiq al-Mahdi? Sadiq al-Mahdi, leader of Sudan’s National Umma Party, is a member of the EU-US-Saudi-Qatari run Arab Democracy Foundation and the Club de Madrid which features former US President Bill Clinton as a “full member” amongst many others, and is backed by Wall Street and London’s myriad of “international institutions” and foundations including the World Bank, the Rockefeller Brothers Fund, the Ford Foundation, Walmart, North Atlantic Treaty Organization (NATO), Microsoft, and many others. Al-Mahdi was elected president of the Umma party in November 1964, and led a campaign to promote political activity, develop political Islam, and reform the party by expanding its base and promoting democracy behavior. Despite his efforts towards a democratic government, there was another coup d´état in 1969 that led to a dictatorship referred to as the May Regime. He was soon arrested by the military government, exiled to Egypt, and detained in Sudanese prisons repeatedly until 1974. Later that year, he traveled abroad and toured Arab and African Capitals where he delivered a number of lectures. While in exile, he formed the National Democratic Front (NDF), comprised of Umma, the Democratic Unionist Party, and the Muslim Brotherhood. Through his efforts, the NDF was able to make an accord of national reconciliation in 1977 with the May Regime that mandated democratic reform. That al-Mahdi, whose coalition included the Muslim Brotherhood that’s played an instrumental role executing recent Western designs in Syria and Egypt, and whose uprising and calls for faux-reform is echoed by the likes of Sudanese extremist leader Hassan al-Turabi (who had in fact invited Osama Bin Laden to Sudan), is now leading protesters through the streets of Sudan’s capital, torching infrastructure, government buildings, and police stations (just as was done across Egypt and Syria), indicates another attempt by the West to overthrow the Sudanese government via proxy militancy. That the West has once again “coincidentally” arrayed its vast resources behind al-Mahdi’s “revolution,” which includes Al Qaeda-linked leaders like al-Turabi, once again illustrates that so-called “Islamic” extremism is a geopolitical tool both created and intentionally perpetuated by the West, both as a pretext for direct military invasion and occupation (Mali, Afghanistan) and as an inexhaustible proxy mercenary force for overthrowing targeted nations (Libya, Egypt, Syria). Sudan shares borders with NATO-overthrown Libya, destabilized Egypt, and US military proxy Ethiopia. It is also across the Red Sea from Saudi Arabia itself. Both Libya and Egypt have sizable US-Saudi-Israeli-Qatari-backed terrorist organizations and their affiliated political arms – the Muslim Brotherhood being the most prominent. 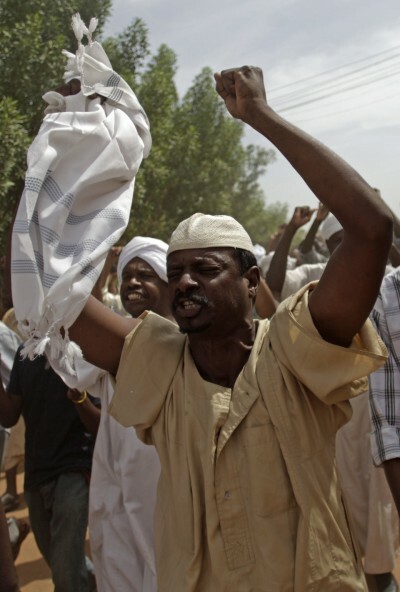 Sudan is a potential tinderbox made more volatile in recent years due to the Muslim Brotherhood’s US-Saudi-Qatari-Israeli enabled rise, along with the Western-backed terrorist organizations, including Al Qaeda, that form it’s armed factions. The West’s interest in Sudan is not causal or spontaneous. It was listed as one of several nations the US had intended to violently overthrow and subjugate as a client regime since at least 2001, revealed in a speech given by US Army General Wesley Clark in 2007. Following the “Arab Spring” playbook, we should expect attempts to justify the increased militarization of the so-called “opposition,” who will at first be portrayed as “pro-democracy” moderates forced to “defend themselves,” but will be fully revealed as Al Qaeda as full-scale proxy military operations get underway. The only way to avert a destructive military conflict is for the Sudanese government to swiftly and severely crush the opposition and secure the borders where NATO-backed militants and their equipment are most likely to flow. Sudan’s government must also make real attempts at reform, while exposing the foreign-backed nature of opposition leaders trying to divide and destroy the nation. By breaking the predictable “evil dictator” mold Sudan’s leadership has been cast in by the Western media, it, and other nations targeted by Western regime change can even the odds leveled against them by the still formidable Western press and their partners in propaganda across Saudi Arabia, Qatar, and Israel. Unprecedented amounts of resources have been committed to the geopolitical reordering of North Africa, the Middle East, and Central Asia. It would be a considerable mistake for any nation overtly listed by the US as “pending regime change” to underestimate any beginnings of unrest clearly backed by foreign interests. While some operations may be “testing the waters,” the final push can come at any time with fully militarized proxies pre-positioned and prepared to sow the same genocidal destruction US-backed terrorists in Syria are carrying out.